GREENBELT, Md. -- NASA's Lunar Reconnaissance Orbiter (LRO) captured the sharpest images ever taken from space of the Apollo 12, 14 and 17 landing sites. 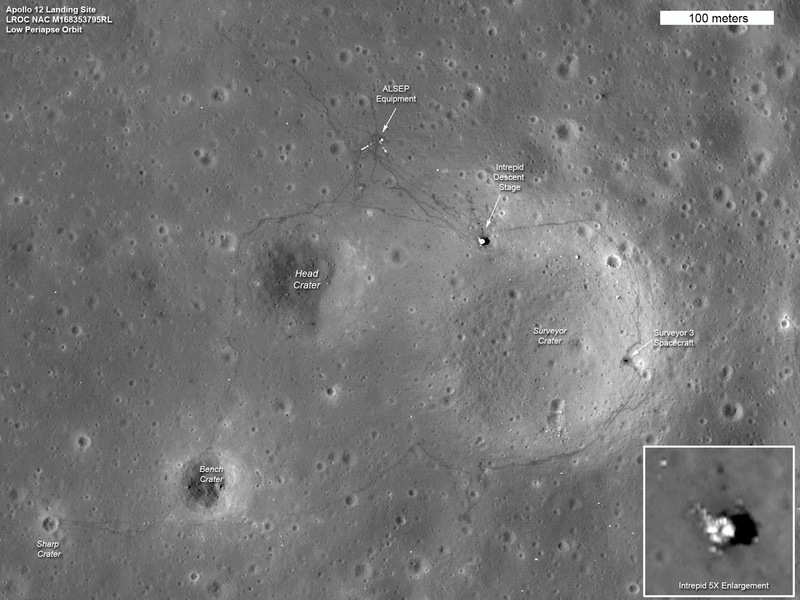 Images show the twists and turns of the paths made when the astronauts explored the lunar surface. At the Apollo 17 site, the tracks laid down by the lunar rover are clearly visible, along with the last foot trails left on the moon. The images also show where the astronauts placed some of the scientific instruments that provided the first insight into the moon's environment and interior. "We can retrace the astronauts' steps with greater clarity to see where they took lunar samples," said Noah Petro, a lunar geologist at NASA's Goddard Space Flight Center in Greenbelt, Md., who is a member of the LRO project science team. All three images show distinct trails left in the moon's thin soil when the astronauts exited the lunar modules and explored on foot. In the Apollo 17 image, the foot trails, including the last path made on the moon by humans, are easily distinguished from the dual tracks left by the lunar rover, which remains parked east of the lander. "The new low-altitude Narrow Angle Camera images sharpen our view of the moon's surface," said Arizona State University researcher Mark Robinson, principal investigator for the Lunar Reconnaissance Orbiter Camera (LROC). "A great example is the sharpness of the rover tracks at the Apollo 17 site. In previous images the rover tracks were visible, but now they are sharp parallel lines on the surface." At each site, trails also run to the west of the landers, where the astronauts placed the Apollo Lunar Surface Experiments Package (ALSEP) to monitor the moon's environment and interior. This equipment was a key part of every Apollo mission. It provided the first insights into the moon's internal structure, measurements of the lunar surface pressure and the composition of its atmosphere. Apollo 11 carried a simpler version of the science package.